End of the summer sales are popping up everywhere lately. 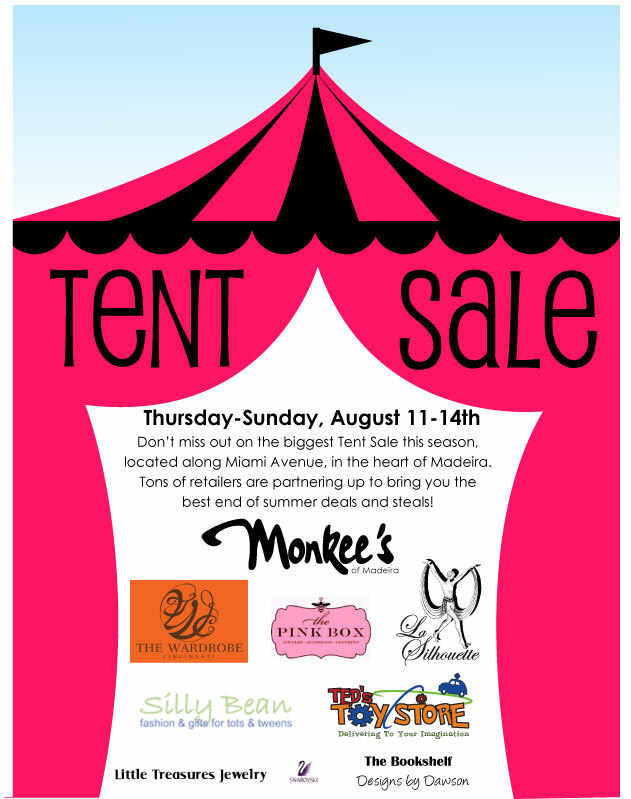 But, don’t miss out on what Madeira is promising to be the biggest Tent Sale of the season. The event starts today, August 11 through the 14th, located on Miami Avenue in Madeira. The stores participating in this event include: Monkee’s of Madeira, The Wardrobe, The Pink Box, La Silhouette, Silly Bean, Ted’s Toy Store, Little Treasures Jewelry, The Bookshelf, Designs by Dawson, among others! Go out to Madeira today through the weekend to get huge bargains on everything from clothes, jewelry, books and toys while enjoying what is left of summer.